Yole Développement has reported the Combo sensors will almost triple from 2012 to 2013. Yole says year 2012 was seen by many as a turnkey year for consumer combo sensors, with high volume adoption in platforms such as Samsung Galaxy S smartphones. 6-axis IMU are already adopted in a growing number of platforms with 6-axis e-compass shipments reaching new records every month and 9-axis solutions is already introduced to the market and more innovative solutions should follow integrating pressure sensing, processing units, and RF capabilities, as per Yole. The combo sensor market is estimated to be $446M in 2013, growing to $1.97B in 2018. This represents 21% of the global inertial consumer market in 2013, and will grow to an impressive 66% by 2018. “While smartphones and tablets are now driving volume increases and adoption of combos, the picture should be different in 2018”, announces Laurent Robin, Activity Leader, Inertial MEMS Devices & Technologies at Yole Développement. “The next market wave should come from wearable electronics, where long-term market potential is huge. While combo sensors will take a significant portion of total market share, opportunities will remain for discrete sensors: from accelerometers used in basic activity trackers to gyroscopes for camera module stabilization”, he explains. The road was not so easy for inertial combos and some challenges still need to be solved. Outside of the offering, which is still smaller than with discrete sensors, combo sensors are sometimes said to be inaccurate or to create constraints for placement on the board (for magnetic field detection: a tiny magnetometer die is often preferred than a larger combo package). Footprint reduction was the only argument in favor of combos in the past. However it is fair to say that significant achievements have been made in the past couple of months. Most of the past yield issues have been solved, leading to lower price. In addition, combo solutions facilitate both qualification and testing at the integrator level, and development of sensor fusion. This report describes the motivations for each type of combo and analyzes the timing for market adoption for each end-application. 4 players share 75% of the market, is there any room for newcomers? 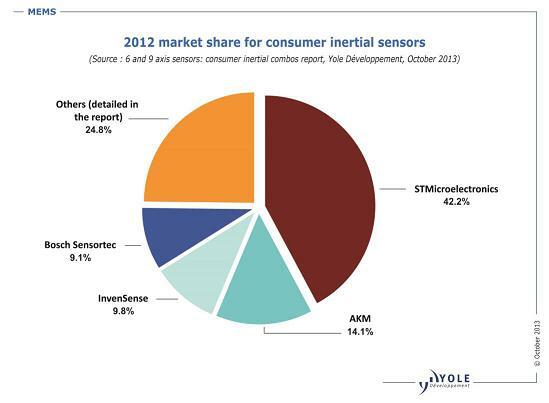 STMicroelectronics is the global leader in the inertial consumer sensor market with 42% market share. Only InvenSense and Bosch Sensortec are able to compete with it today. It is key to be able to control the different technologies or to establish the right partnerships to sell a large range of combo solutions. ST is just starting to sell its own magnetometer in 2013, while Bosch has been very active in launching new product lines since 2012. InvenSense has just partnered with Melexis as an alternative source to AKM for the magnetometer die in 9-axis solutions, although this is not official information. Price is still sharply dropping, with IMUs sold to some large volume customers below $1 in 2013. To stay in the race, the 3 leaders are going to introduce technical innovations: monolithic integration of 6 to 9-axis, use of TSV, chip scale packaging, and active capping. Current challengers and newcomers are eyeing this combo opportunity and expect to take market share while the supply chain is not yet mature. Kionix, Freescale, Alps Electric, Fairchild, Maxim and more than 10 other companies are targeting this market space. New business models are built and more fabless companies are likely to be involved in the combo market. Details on newcomer technologies and roadmaps are provided in the report. Value is moving to function delivery with embedded sensor fusion Sensor fusion developments must be taken seriously. There has been hype about it for many years and now we start to see commercial implementation. The first real products with sensor fusion are already on the market, such as sensor hubs in the latest smartphones and tablets from Samsung and more recently by Apple, with the M7 processor in iPhone 5S. In addition, GPS chipsets with indoor navigation capability relying on MEMS sensors are now available from CSR, Qualcomm and Broadcom. 94Fifty, Adidas, Aichi MI, AKM, Alps Electric, AMS, Analog Devices, Apple, Archos, Aruba Networks, ASE, Atlas, Atmel, Babolat, Baolab, Blackberry, Bosch Sensortec, Broadcom, Cambridge Mechatronics, Casio Micronics, CSR, DNP, Domintech, EMMicroelectronics, Epson, FitBark, Fitbit, Freescale, Fujitsu, Full Flight Technology, Garmin, Gionee, GlobalFoundries, Google, Hana Microelectronics, Hillcrest Labs, Hisense, Honeywell, HTC, Huawei, ICsense, Instabeat, Intel, InvenSense, Isentek, Jabra, JCAP, Kionix, KYEC, Kyocera, LG, Lingsen Precision Industries, Marvell, Maxim, Mcube, Mediatek, Melexis, Memsic, Metaio, Microsistemler, Microsoft, MiraMEMS, Mobiplex, Mosoro, Motorola, Movea, MultiDimension Technology, Murata, NEC, Nike, Nikon, Nintendo, Nokia, Nvidia, NXP, Nyko, Orbotix, Panasonic, Pantech, Pebble, PNI Sensors, QFO Labs, QST, Qualcomm, Qualtre, Recon, Rohm, SAE Magnetics, Samsung, Senodia, Sensitec, SensorPlatforms, Sharp, Sigurd, Sixense Entertainment, SMIC, Sony, Sony Mobile, Spreadtrum, STMicroelectronics, TCL, Teledyne Dalsa, ThalmicLabs, TI, TomTom, Toshiba, Tronics, TSMC, TUMEMS, Vuzix, Whistle, Withings, XFab, Xiaomi, XSens, Yamaha, ZTE.